You can schedule and run WSUS cleanup tasks from the Configuration Manager console from the Software Update Point Component properties. When you first select to run the WSUS cleanup task, it will run after the next software updates synchronization. Select the site at the top of your Configuration Manager hierarchy. Review the Supersedence behavior. Modify the behavior if needed. 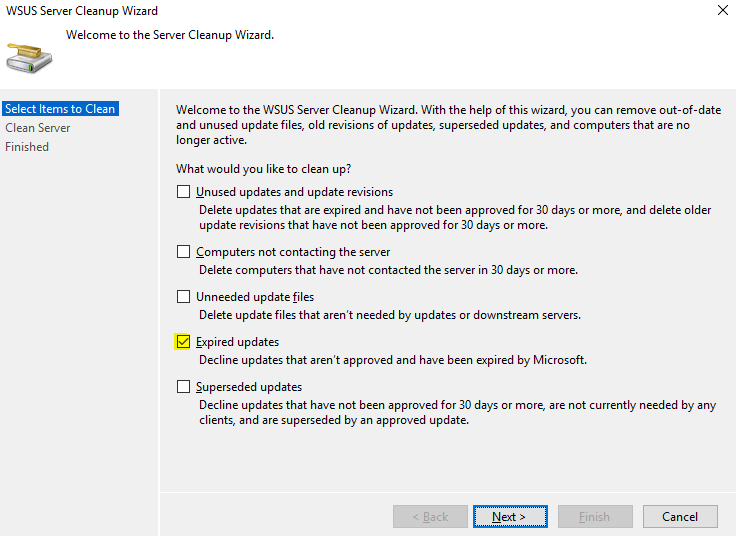 Click the Supersedence Rules tab, select Run WSUS cleanup wizard. In version 1806, the option is renamed to Run WSUS cleanup after synchronization. Click OK (Click Close if you're running version 1806). The Expired updates option from the WSUS cleanup wizard on the top-level site's WSUS server only. A cleanup for software update configuration items in the Configuration Manager database occurs every seven days and removes unneeded updates from the console. This cleanup won't remove expired updates from the Configuration Manager console if they're currently deployed. Additional maintenance is still needed on the top-level WSUS database and all other WSUS databases in the environment. For more information and instructions, see The complete guide to Microsoft WSUS and Configuration Manager SUP maintenance blog post. The Expired updates option for WSUS servers on CAS and primary sites. WSUS servers for secondary sites, don't run WSUS cleanup for expired updates. Configuration Manager builds a list of superseded updates from its database. The list is based on the supersedence behavior in the Software Update Point component properties. The update configuration items meeting the supersedence behavior criteria are expired in the Configuration Manager console. The updates are declined in WSUS for CAS and primary sites but not for secondary sites. The "Months to wait before a superseded update is expired" is based on the creation date of the superseding update. For example, if you use 2 months for this setting, then updates that have been superseded will be declined in WSUS and expired in Configuration Manager when the superceding update is 2 months old. For more information and instructions, see The complete guide to Microsoft WSUS and Configuration Manager SUP maintenance blog post. The Expired updates option for WSUS servers on CAS, primary, and secondary sites. The updates are declined in WSUS for CAS, primary, and secondary sites. The WSUS cleanup is starting when you see this entry: Calling WSUS Cleanup. The WSUS cleanup for expired updates is complete when you see this entry: Successfully completed WSUS Cleanup.